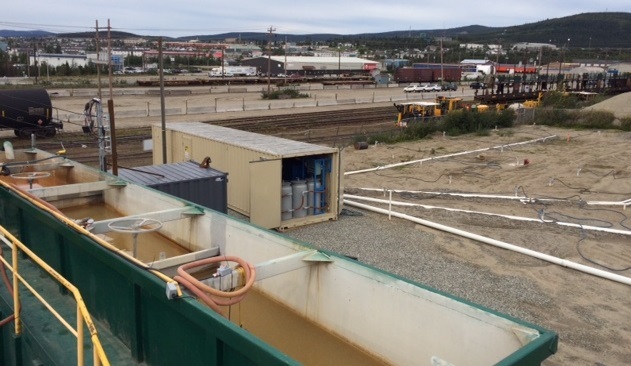 Advanced, innovative technologies are changing the way professionals tackle contaminated sites. These techniques cost-effectively provide high resolution information on contaminant distributions and subsurface dynamics in real-time. This information provides a critical reduction in cost and uncertainty enabling accurate conceptualization of site dynamics and the development of effective strategies for site management. The UVOST® technology efficiently delineates petroleum, oil, and lubricant (POL) contaminants in the subsurface. All the usual forms of POLs, including; gasoline, diesel fuel, jet fuel, and hydraulic fluids, can be detected via the fluorescence response of their polycyclic aromatic hydrocarbon (PAH) constituents. This response provides both qualitative and quantitative information on the petroleum products identified in the subsurface, enabling the identification of product type and relative concentration data. The TarGOST® performs the same function for heavier NAPLs with high PAH content – Coal Tar, Creosote, etc. 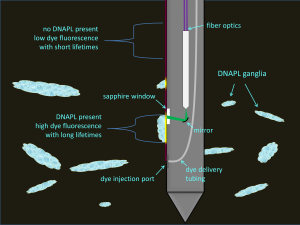 The Minnesota Pollution Control Agency (MPCA) Petroleum Remediation Program (PRP) routinely uses laser-induced fluorescence (LIF) data to target petroleum light non-aqueous phase liquids (LNAPLs) when remediation is necessary. 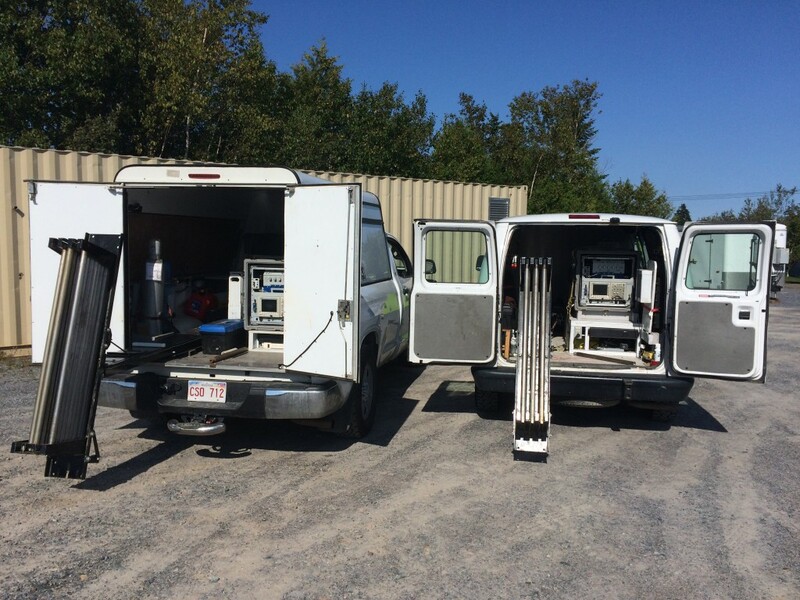 Paul Stock, Hydrogeologist with the MPCA PRP, authored an excellent article describing the LIF technology, uses and limitations in the June 2011 LUSTLine, Bulletin 68, beginning on page 13. The membrane interface probe (MIP) is a screening tool used to log the relative concentration of volatile organic compounds (VOCs) with depth in soil. The probe is robust and percussion driveable with direct push machines. The MIP membrane is comprised of a semi-permeable, thin film polymer impregnated into a stainless steel screen for support. The membrane is placed in a heated block that is advanced into the soil. With heat, volatiles diffuse across the membrane and partition into a stream of carrier gas where they are swept to the detectors. For VOC detection, a photoionization detector (PID), a flame ionization detector (FID), and a halogen specific detector (XSD) are utilized. This combination enables qualitative and semi-quantitative assessment of the contaminants encountered. 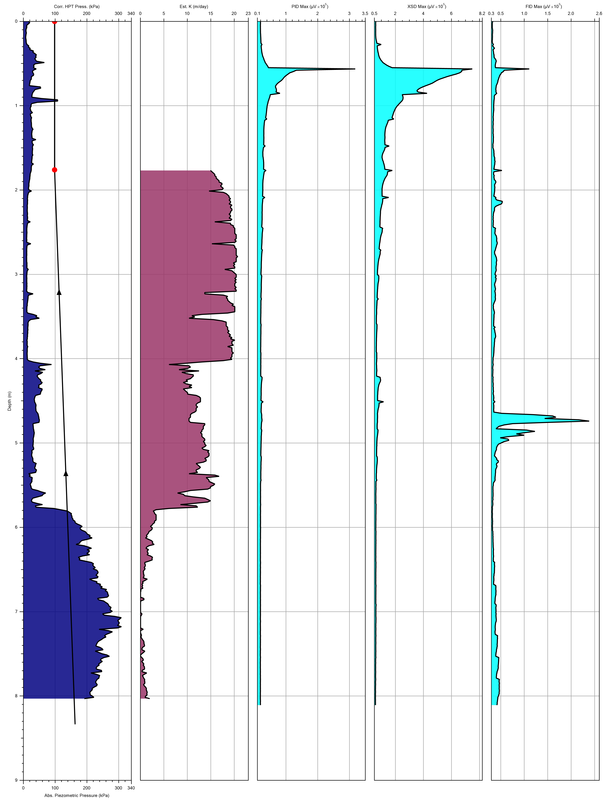 The MIP acquisition software logs detector signal with depth. Real-time, in-situ detection of volatile organic compounds (halogenated and non-halogenated). Production data provides VOCs discreet spatial delineation, relative concentrations and general speciation. Able to log in saturated and unsaturated materials. 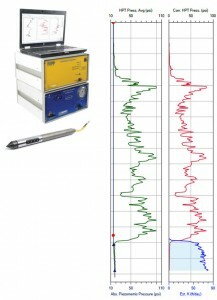 Coupled with the Electric Conductivity probe and Hydraulic Profiling Tool (optional) to provide hydrogeological context to contaminant distributions. A leading edge technology utilized worldwide for the characterization and management of petroleum and halogenated hydrocarbons. The following example log displays HPT injection pressure, pieziometric pressure, estimated hydraulic conductivity, PID, XSD and FID data highlighting the wealth of information collected from a single MiHPT push. In this instance the MIP data identified a high concentration of chlorinated solvent impacts in the near surface tapering off into the saturated zone (water table identified at 1.75 meters below ground surface). 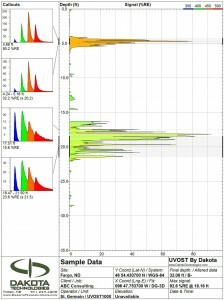 The HPT data displays three distinct hydrostratigraphic units in the saturated zone correlating to sand with inter bedded silt, silty sand, and clay. Together this high resolution information enables the accurate conceptualization of impacts and the hydrogeologic context, greatly improving the efficacy and efficiency of further assessment, remediation and risk management activities. Dakota has developed the Tar-specific Green Optical Screening Tool or TarGOST®. TarGOST was developed exclusively for detection of coal tars, creosotes, heavy crudes, and tank bottoms. Following a comprehensive spectroscopic study of coal tar behavior, Dakota created this method which results in a monotonic response for coal tars on a variety of soils. Lab tests of TarGOST indicate the system is ideally suited for delineating the NAPL contaminated zones or source material at former manufactured gas plants (MGPs) and wood treating facilities. Click here for more information. To learn more about HRSC and how it can help at your impacted site please contact us.